Tuck point blades are used with angle grinders and tuck pointers for fast mortar removal, grout repair and cleaning of concrete applications. All tuck point diamond blades can be used wet or dry. 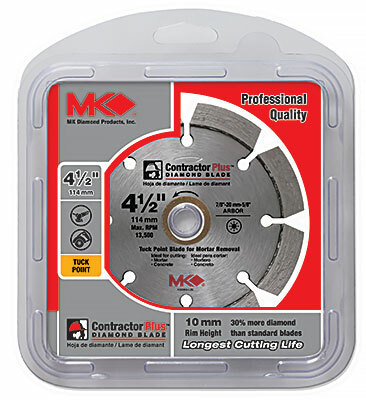 Contractor Plus blades provide fast cutting speeds and have a higher diamond for extended blade life. These blades allow for an even faster rate of removal and greater productivity.